The Canadian Government declared 3,900 invitations to appeal for Canada permanent residence in a recent invitation round of Express Entry conducted on Dec 12. The least score in the present draw was 445. It was the 6th Express Entry draw in a line to announce 3,900 Invitations to Appeal and leaves Canada only 124 requests shy of a current record for the most I.T.A's announced in a particular year. 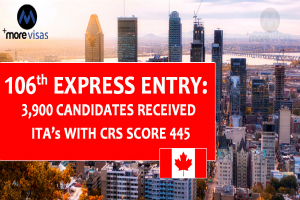 Immigration, Refugees and Citizenship Canada (I.R.C.C) implemented the 'tie-break' rule for Express Entry applicants with a C.R.S score of 445. It means that I.T.A's will be announced to all applicants with scores above 445 as well as applicants with scores of 445 who provided their Express Entry profiles before Nov 28, 2018, at 09:51 UTC. Qualified candidates are entered into the pool of Express Entry and are allotted a C.R.S score out of 1,200 depends on the factors such as work experience, education, and French or English language proficiency. I.R.C.C encourages the highest-ranking applicants by regular draws from the pool. Applicants announced an I.T.A have 60 days from the receipt date to present a full Canadian PR application to the Canadian Government.